UPDATE (9 April 2019): please be aware that charter organisation registrations for 2019 are now CLOSED. – AfrikaBurn is a radically self-reliant event at which nothing (other than ice) is for sale, and where all participants are expected to set up, break down and maintain their own camps and campsites. No paid staff are permitted to maintain camps, clean them or cook for the campers. – Flying into the event limits the amount of baggage that you would be able to carry to the event – for all your other camp infrastructure, you must arrange transport and/or erection with your fellow campmates. – The event does not offer an airport pick up or transfer services, at all. If you are flying in or out as a passenger, the onus is on you to organise members of your camp to be available at your designated time of arrival or departure, to ferry you or from our Airstrip – and this can only be achieved by the use of a registered Mutant Vehicle (mobile artwork). No personal vehicles are permitted to approach our Airstrip under any circumstances – because no personal vehicles are permitted to drive around the event site. If a personal vehicle approaches the Airstrip, our Event Guardians and Airport staff will instruct the driver that they must return the vehicle to their campsite until they leave the event site (which is the same policy for all personal vehicles at the event). – All staff at our Airport are volunteers who are giving their time and skills to ensure all flying vehicles and their passengers and pilots (as well as the participants of Tankwa Town) remain safe. Please treat them with courtesy. This is where you will find resources for anyone wishing to take to the skies in the vicinity of Tankwa Town, whether as a passenger, pilot, model aircraft/drone pilot, skydiver or even if you wish to stage a flying art piece. Please be aware that there are fees associated for anyone wishing to use the airspace at Tankwa Town. An Airspace pass is R300 and can be purchased from Quicket before the start of the event. A late arrival Airspace pass is R500 and can also be purchased from Quicket or at the event on arrival – this tariff will be applicable during the event. You can find these fees and links to Quicket in the links below. 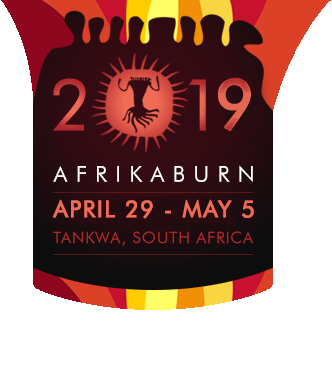 Drones, remotely piloted aircraft systems and model aircraft flying are not permitted at AfrikaBurn due to Civil Aviation Authority legislation. VOLUNTEER TO BECOME PART OF OUR TEAM! We’re always in need of helping hands to ensure the airstrip runs smoothly. Whether you love aeroplanes or not, the airstrip is always an interesting post to volunteer at. Here you will have a unique opportunity to get up close to some interesting light aircraft, meet the pilots and other aviation enthusiasts. To sign up as an Airspace volunteer, CLICK HERE – we’d love to meet you! All passengers, pilots and other users of the airspace (including skydivers) are required to pay a fee for the airstrip facilities, processing and management. See our Airspace Fees page for all the info. Flying into Tankwa Town is not the same as a normal domestic flight. If you’re planning to fly to AfrikaBurn, please read our info about Flying to AfrikaBurn as a Passenger. Pilots are required to read up about the specifics of flying into and out of our remote airstrip. For all info, please read our Flying to AfrikaBurn as a Pilot page. Our airstrip is located in a desert environment where dust storms and occasional torrential downpours can reduce visibility to zero. For the latest conditions and guidelines on weather, please read our Weather and Conditions page (which includes links to cameras that are live during the annual event period). For Airspace enquiries not covered in the info above, or for volunteer queries, please contact [email protected] or visit our Facebook page.